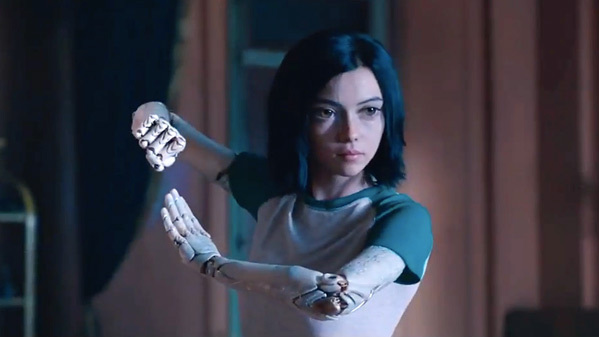 "She is threatening the natural order…" 20th Century Fox has released the second official trailer for Alita: Battle Angel, about a deadly cyborg humanoid named Alita, played by Rosa Salazar, who is found in a scrap heap by Dr. Dyson Ido. This new trailer was originally shown in Hall H at Comic-Con last week, and now available for everyone else to watch. They used James Cameron and Laeta Kalogridis' original script that has been going around, and Cameron is also a producer along with Jon Landau. Cameron was supposed to direct for years, but handed it over to Rodriguez. The film's full cast includes Jennifer Connelly, Eiza González, Michelle Rodriguez, Christoph Waltz, Jackie Earle Haley, Jeff Fahey, Mahershala Ali, Ed Skrein, and Casper Van Dien. I know this will be debated and argued endlessly - but I think this looks awesome! A very heavy CGI futuristic world, fully realized, with some crazy cool characters. The anime eyes don't bother me, and I'm sure the CGI will be polished by the time it opens in December. Fire this up. You can still watch the first official trailer for Alita: Battle Angel here, to see the original reveal for this. Alita is a creation from an age of despair. Found by the mysterious Dr. Ido while trolling for cyborg parts, Alita becomes a lethal, dangerous being. She cannot remember who she is, or where she came from. But to Dr. Ido, the truth is all too clear. She is the one being who can break the cycle of death and destruction left behind from Tiphares. But to accomplish her true purpose, she must fight and kill. And that is where Alita's true significance comes to bear. She is an angel from heaven. She is an angel of death. Alita: Battle Angel is directed by American filmmaker Robert Rodriguez, of El Mariachi, Desperado, From Dusk Till Dawn, The Faculty, Spy Kids 1 - 4, Grindhouse's Planet Terror, Sin City, Machete 1 & 2, and Sin City: A Dame to Kill For previously. The screenplay is written by James Cameron and Laeta Kalogridis; based on Yukito Kishiro's acclaimed manga series first published in 1990. 20th Century Fox will release Rodriguez's Alita: Battle Angel in theaters everywhere starting on December 21st this holiday season. Looking better?